Just 30 kilometres south-east of Florence, 400 metres above sea level, on the side of a hill covered with oak and chestnut woods and olive groves, lies Colle a Pitiana. It is surrounded by green countryside both environmentally intact and of great naturalistic interest, preserved by several nature reserves and protected areas, and slopes down from the ridges of the mountains at Pratomagno down towards the Arno river valley, on the opposite side from the Chianti hills. The area is covered in precious historical and artistic artefacts that document the ancient human presence in these places, and is dotted with old villages, castles and churches. The villa started out as a roman watchtower, and was then included in renaissance times in the property of the Guicciardini family (the noble florentine family who also owned the church called Pieve a Pitiana, a church going back to the year 1000, with its romanesque bell-tower and 2 wooden panels by Ghirlandaio inside, at the base of the hill where the villa stands) and was then in time converted into a farmhouse. It has recently been subjected to a careful renovation: the interior is on several levels and the furnishings are in a refined and elegant country style which integrates effortlessly with many high-tech details, such as modern, pratical bathrooms, an efficient kitchen with fireplace and the use of a barbecue, oven, dishwasher, microwave, american fridge, satellite TV, DVD/CD/MP3 player, and a broadband wi-fi internet connection. The owner lives in a completely independent dependence. The interior of the annex is nice but more basic and simple compared to the villa. Outside there is a garden, also on several levels, of 8000 sq.m, a nice 5x9m swimming-pool, a loggia with a fireplace for barbecues and furnished for relaxing, and large terraces, all of which dominates the church and the valley below with the view stretching out as far as the Chianti hills in the distance. 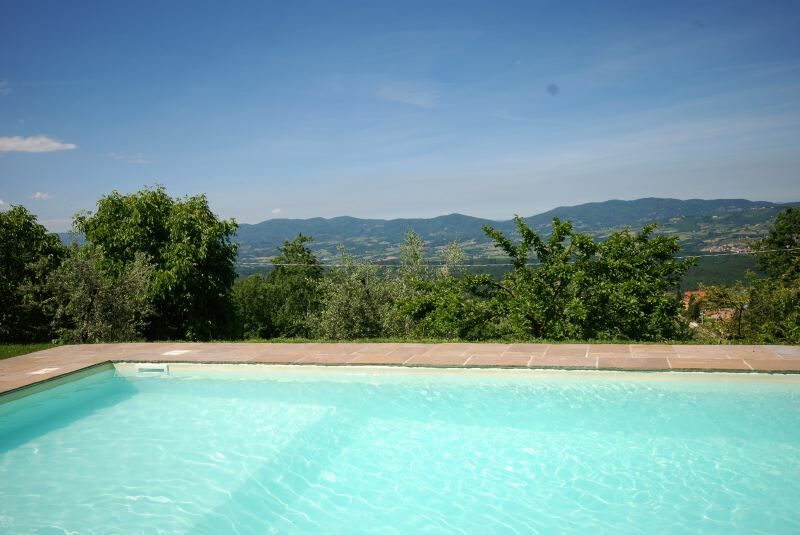 This is the kind of place that, due to the quality and depth of the panoramic view it offers, invites you to rest yourself and relax, and at the same time offers the possibility of reaching all of the more interesting sights in Tuscany in a short drive. Air conditioning in the tower. TOWER: master bedroom with small studio with single sofa-bed and air conditioning (suitable for children and usable on demand) and en-suite bathroom with bath-tub and shower.